Does your neck hurt? Your back? The ADA Council on Dental Practice’s Dental Wellness Advisory Committee conducted a 2015 survey to study the well-being of dentists. Poor ergonomics emerged as a major issue, according to ADA News. Two-thirds of the respondents reported that they suffered from neck pain and nearly half of them said that it was either moderate or severe in its intensity. A similar percentage reported low back pain and again, half of those surveyed said that it ranged from moderate to severe. Three members of the committee who were selected for their ergonomics expertise — Timothy J. Caruso, Tamara James and Robert Werner, M.D. — prepared a report in late 2017 that addressed musculoskeletal problems and their causes based on the survey’s findings. Mr. Caruso is a physical therapist who has served on the committee for over a decade; Ms. James is director of ergonomics at Duke University’s Occupational and Environmental Safety Office; and Dr. Werner is former Chief of the Physical Medicine & Rehabilitation at the Ann Arbor VA Medical Center. The practitioners’ seated posture if the patient chair does not allow them to easily access the oral cavity. Bending, twisting and assuming awkward positions when treating the patient. Poor intraoral lighting that leads to perching on the edge of the operator stool and peeking into the oral cavity. An operator stool that will not adjust up and down and has an unstable seat, requiring the dentist to sit askew on the seat in order to maintain a balanced sitting position. Instruments that are not properly sharpened that require more exertion in order to be effective. Seeing a primary care physician, with possibly a referral to a physical therapist. Massage, exercise, acupuncture and chiropractors might offer relief. A treatment called the McKenzie Approach, which can help mitigate back and neck pain. The approach is performed by specially-trained physicians who are well-versed in the care of back and neck pain. To find a clinician who performs this procedure, visit mckenzieinstituteusa.org. The authors also stress research when purchasing loupes. The magnification level, working length, field of view and the angle of declination must all be determined in order to maintain good head and neck posture, they said. Ideally, the authors maintain, dentists should have their loupes properly fitted by a trained optical specialist, with the fitting done in their own dental operatory with a volunteer in the chair. Poor-fitting loupes can cause the practitioners to drop their head in order to achieve proper focus and declination angle to see the oral cavity, leading to poor posture along with neck, shoulder and neck pain. Stopping pain before it starts is always best, the authors said. 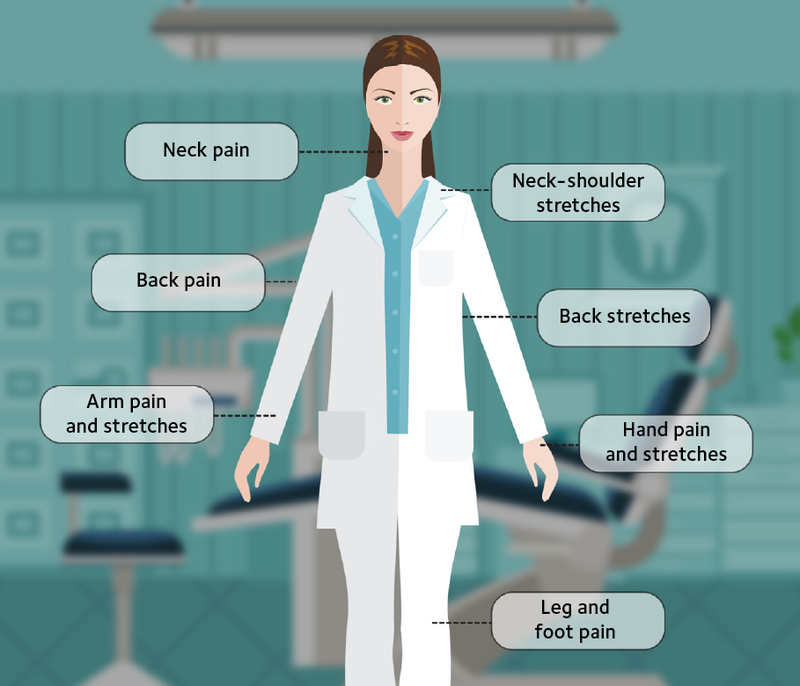 Dentists should focus on how they work, how they hold instruments and how neck and back posture could be contributing to their aches. One way to do this is to have a staff member photograph or video a dentist’s procedures to get a better understanding of what may be contributing to the pain. The authors also recommend looking at the layout and design of the operatory. In the case of the patient chair, having a chair that is too thick or too wide can impede a practitioner’s access to the oral cavity. For more information, the 2015 ADA Wellness Survey can be found at the ADA’s Center for Professional Success. THERE HAS BEEN AN ONGOING STUDY FOR OVER 50 YEARS OF THE HEALTH OF DENTISTS, PHYSICIANS AND NURSES BY THE HARVARD SCHOOL OF MEDICINE. i HAVE BEEN A PARTICIPANT AND DO STILL PARTICIPATE IN THE STUDY OF DENTISTS. I BELIEVE THE PLAN IS TO FOLLOW THESE PROFESSIONALS FOR THEIR LIFETIME AND ONCE THEY ARE GONE TO DETERMINE WHAT HABITS OR OTHER FACTORS INFLUENCED EITHER THEIR LONG LIFE SPANS OR THEIR EARLY DEMISE? THE DIRECTORS OF THE STUDY DO CONTACT ME ONCE A YEAR WITH UPDATES ON THE FINDINGS OF THE ONGOING STUDIES. i HAVE HEARD THAT THE NURSE PROGRAM HAS HELPED IN THE TREATMENT OF BREAST CANCER AND ITS CAUSES? If I may add my 2 cents – swimming is whats going to help your neck and back in this profession. Thank you for a great article. Very well written and informative. This is a great article. I always do some minor stretching after treating a patient and I am aware of my posture at all times. In our line of work we have to correct ourselves at all times on our posture and make sure we go to the gym to strengthen the back muscles.